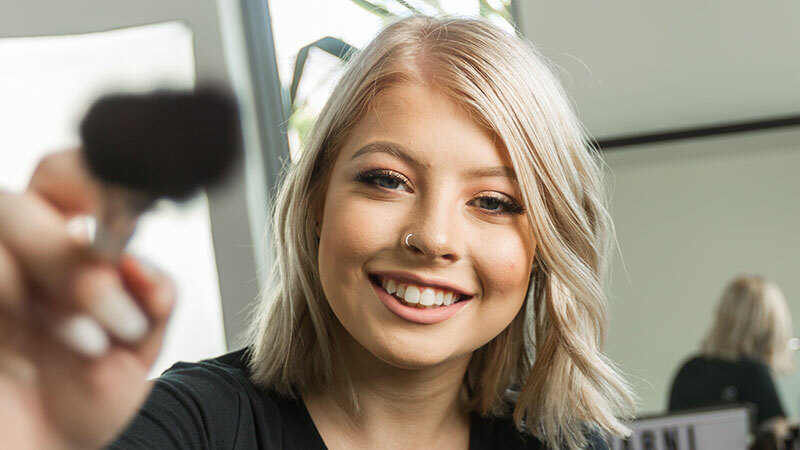 Forge a career as a make-up artist or technician for film, TV or photography with a Diploma of Screen and Media in Specialist Make-Up Services at Victoria University Polytechnic. body art and facepainting events. Extend your knowledge as a make-up artist by learning sketching, presenting of photographic portfolios in print and digital format, sculpting, body art, and airbrushing. You’ll also learn to create and style wigs and hairpieces. We will ensure you have all the skills to succeed as a make-up/hair stylist or designer in the creative industries. In this course, you’ll gain an understanding of business plans, marketing and client interactions in the industry. Victoria University Polytechnic is recognised as the leading make-up school in Australia. Victoria University Polytechnic has strong relationships within the fashion, entertainment and creative arts industries. You’ll have opportunities for valuable work experience and the chance to make contacts for future employment. There are also regular opportunities to showcase your skills through an extensive events calendar, including community competitions and fundraising activities. You’ll get hands-on experience at our City King student-run hairdressing and beauty salon. This salon provides the ideal training environment, where you can practice your skills while providing services to the public. You’ll learn from expert trainers and work under their guidance. Victoria University Polytechnic hair and make-up students won two awards at the 2016 Hairdressing and Beauty Industry Association (HBIA) Apprentice, Student and Educator Awards. These awards provide an opportunity for industry leaders to recognise young achievers in the industry. The growth in digital television and online content delivery has seen the rise of new job roles and opportunities within these industries. The Diploma of Screen and Media specialising in Specialist Make-Up Services will give you the technical skills needed for a career as a make-up artist in the creative industries. Many make-up artists are self-employed and work on a freelance basis. Major employers of these individuals include independent television companies and large film studios. Make-up artists are often employed by individuals for weddings or other important events. Sharni Chandler has overcome years of bullying at school to become a prize-winning make-up artist. two (2) units may be selected from the remaining listed electives or any currently endorsed training package qualification or accredited course at Certificate IV, Diploma or Advanced Diploma level. Elective units must be relevant to the work environment and the qualification, maintain the integrity of the AQF alignment and contribute to a valid vocational outcome as well as be approved by the Polytechnic. The Polytechnic currently offers the following specialisation(s): Specialist Make-up Services. - Six (6) specialist units must be selected from Group B, and must include CUAMUP401 Design, apply and remove make-up and CUAMUP403 Style hair for performance or productions. Browse our other Make-up courses or send us an enquiry to be notified of updates relating to this course.